*OAC Means "On Approved Credit"-Your actual interest rate will be based on your creditworthiness. All rates & terms are subject to change. We are very excited to announce that our ATM is now live and available for use! Normal hold times apply for checks deposited. SLO Credit Union is offering Home Equity Loans! Take advantage of the equity in your home! Effective January 1, 2018 you must leave $5.00 in your prime share account to retain your membership. $5.00 equals one share of ownership of SLO Credit Union. Thank you for your support of SLOCU! Notaries are available during the hours of 9:00 am to 4:00 pm for members only. Appointments are suggested to ensure staff is available. Notary staff reserve the right to refuse to notarize a document that is incomplete. notarized that is not a SLO Credit Union document. Click on the link below for more information and to apply! Is SLOCU your credit union? Click to find out more or to get started using it today! 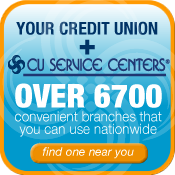 SLO Credit Union is now part of the CU Service Centers. You can access your account, anywhere you see the CU Service Center swirl. You can also download the app to your phone to find the closest shared branch wherever you are. Click or call 888.CU.SWIRL to find the location nearest you!